In CrossFit and Olympic Weightlifting, the squat clean is a full body functional movement that builds strength and power. If you lift weights at all, you will benefit from adding the squat clean into your training. While CrossFit athletes refer to it as the “squat clean” (differentiating from the sister lift, the power clean), Olympic weightlifters simply refer to this movement as the ‘clean’. If you follow both sports, you may know why. If not, you’ll find out in this guide. CrossFit athletes, take note of this movement: the clean has come up in over 70% of CrossFit Opens (5 out of 7 years) and have almost always been featured at the CrossFit games. Two examples include the 2012 CrossFit Games Clean Ladder and the 2016 CrossFit Games Clean Pyramid. The main benefit of the squat clean is that, with good technique, you will be able to move more weight than with the power clean. In the squat clean vs. power clean section, you will learn more about why. In this section, you’ll learn which muscles are developed with the squat clean. In a full squat clean, all the muscles used in a front squat are also developed. In the lower body, squat cleans develop the quadriceps, hips, hamstrings and glute muscles. There is also a considerable amount of core strength necessary to start and finish the movement. Your abdominals and lower back are forced to brace on both ends. In the upper body, your lats and shoulders contribute to the clean during the “shrug” phase (second pull in the diagram above). The athletic carryover of heavy squat cleans is high. You develop all of the muscles needed to become a more powerful, explosive athlete when you perform heavy squat cleans with sound technique. The squat clean is more effective for moving heavier weights for a simple reason: you don’t have to get the bar as high off the ground as with the power clean. Once you get good at the movement, you’ll be catching the bar in the receiving position almost a full foot lower than during a power clean! In a power clean, the bar must travel to about chest height. With a squat clean, the bar needs to go about as high as your belly button. If you’re quick with the drop, that should be enough to get underneath the bar and catch it. This is why you rarely see the power clean used in Olympic weightlifting. The goal of the sport is simple: to move the most amount of weight possible. As such, the squat clean is the better choice. Getting a 495lb bar off the ground at all is impressive, but this should highlight a major benefit of the squat clean. At that weight, think about how much more power you’d need for even a few inches of bar height. In this sense, weightlifting truly is a game of inches. The squat clean allows you to move more weight in training and competition. Whether you’re trying to find a new 1RM or string these together in a WOD, here’s how to perform the squat clean, step-by-step. For the most part, set up for a squat clean like you would set up for a deadlift. Hips high, head over the bar, arched back, and weight in the heels. The major 2 differences are your grip, and positioning of the bar under your feet. While the barbell deadlift uses the switch grip, you’ll want to use a hook grip when doing squat cleans. This is the case with all Olympic weightlifting movements. Basically, you lock your thumb under your index and middle finger, effectively “hooking” your hand onto the bar. At first, it will be uncomfortable, but over time it feels better. Make no mistake, though. Without learning how to hook grip, you will seriously short change your 1RM on any of the Olympic lifts, including the squat clean. One minor (but important) detail is the difference in where to line your feet up under the bar. With the deadlift, the bar should be at the top of your shoelaces. This ensures that the bar will remain as close to you as possible without rubbing your shins once you begin the movement. As small as this is, it will pay off when you perform heavier squat cleans. You will be able to pull the bar in closer to your hips during the deadlift portion of the lift (see below), generating more power from the shrug and hip extension in the process. The major difference here is bar speed. If the bar is too close to your legs, you risk your knees and shins getting in the way. This slight adjustment with your feet will help prevent this from happening. Think of the squat clean as an aggressive movement. The movement is completed quickly and powerfully. With heavier weights, you truly have to give it everything you have in order to be successful. That said, if you’re new to the squat clean, you don’t know what you’re looking for. You might miss the different phases of the movement in real time speed. In a full squat clean, the bar begins on the ground and is brought up to the waist. It is not a full squat clean if you don’t start from the ground. That is called a “hang” clean. The technique of this portion of a squat clean is the same as a regular deadlift. As discussed above, the two major differences are your grip and foot positioning. The second portion of the movement begins right as the deadlift reaches lockout. The athlete should shrug up as high as they can and extend the hips forward, generating power that moves the bar vertically. If the weight is heavy enough, the athlete will come up on their toes briefly. This means they are using their hip and shrug power to generate as much force as possible as they move the bar. Almost immediately after the shrug, the athlete must drop underneath the bar as quickly as possible to the receiving position. This position is the bottom of a front squat. As he or she drops, they must also shoot their elbows forward and prepare to receive the bar in the front rack position. This is called the “catch”. A lot must happen at once for this part of the movement to be done correctly. With practice, it will become automatic. The key is to not drop into the receiving position until after the full shrug/extension of the hips. This will result in a loss of power and likely missing the rep.
Cuing “elbows to the ceiling” or “elbows high” will help a newer athlete get a feel for the bottom of the receiving position. Practicing front squats will also help. At this point, the hard part is over. Standing up from the bottom of a front squat to a lockout finishes the rep.
Drive through your heels until your hips and knees extend, and finish with your elbows high. As long as you have bumper plates, it’s safe to drop the bar from the finish position to the floor. If you are performing multiple reps, simply hook grip the bar and go again. As with any Olympic weightlifting movement, you will want to start light and work on technique when you decide to incorporate squat cleans into your training. If possible, have a coach watch and give feedback. Above all, you must master good squat clean technique before you start piling on the 45lb plates. Even light reps performed quickly will make you more explosive and help your body learn the movement. Dropping under the bar too quickly- the shrug and hip extension cannot be short changed. You must simply get faster at extending and then dropping under the bar if you ever want to move a lot of weight. Bend in the elbows– it’s a shrug, not a row. Use your lats and shoulders to pull the bar as high as you can. Don’t attempt to muscle the bar to the catch position with your arms. Catching the bar with your elbows down- this is common for beginners and people who haven’t done a lot of front squatting. If your wrists or forearms hurt during squat cleans, you are probably doing this. When you catch the bar, make sure you drive your elbows to the ceiling from the bottom of the catch until you stand back up. If your goal is to increase total strength, keep the number of repetitions low and the number of sets manageable. Even the best Olympic weightlifters in the world rarely do more than 5-7 sets in a training session with cleans. The reason for that is simple: it’s a taxing movement, and they want to be able to train the movement again soon. Heed this advice and limit the number of heavy sets to 3-5 after an appropriate warm up. On the other hand, if your goal is to increase hypertrophy of the lower legs, back, or shoulders, you may want to choose a different exercise. Squat cleans are better for power and strength development than hypertrophy. Consider more isolated exercises like squats, shrugs, or Pendlay/Yates rows. CrossFit is the only setting where performing high rep squat cleans is necessary. If your goal is to increase full body strength by incorporating squat cleans, perform between 1-3 sets. 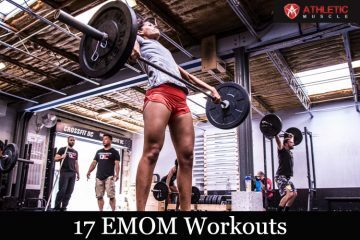 As long as your technique is good, squat cleans fit nicely into EMOM workouts, or can be used for accessory/skill work. Some workouts, like the famous WOD from the 2008 CrossFit Games nicknamed “Heavy Squat Clean Grace”, will call for high repetition squat cleans. This particular workout is 30 155lb squat clean and jerks for time. The squat clean is the preferred variation of the clean exercise any time the bar is loaded with heavy weights. You don’t have to pull the bar as high as a power clean, which will allow you to lift more weight. There are 4 phases to the squat clean: the deadlift, the shrug, the drop, and the finish. Common faults when you get started can be fixed with cues like “elbows high” and “big shrug”. Make sure you know how to hook grip properly and you read the tip on where to line up your feet. Whether you are a CrossFit athlete or just enjoy strength training, the squat clean will make you a better athlete. Give it a try! I help college athletes maximize their 4-year sports window and succeed after graduation.